Ever since India’s tour of Australia down under, wicket-keeper batsman Rishabh Pant has been a name, people have found hard to ignore. The left-handed smash hitter went viral for his on-field conversations with Aussie skipper Tim Paine. While Paine mocked the youngster by asking him to babysit his kids, Pant went on to hit back hard by taunting Paine’s temporary role as captain. But the twist in the story came when Pant actually clicked a photo with Paine’s wife and children, which earned him the tag of a ‘babysitter’. While that happened back in January, come April, Rishabh Pant seems to have taken his new-found title very seriously. 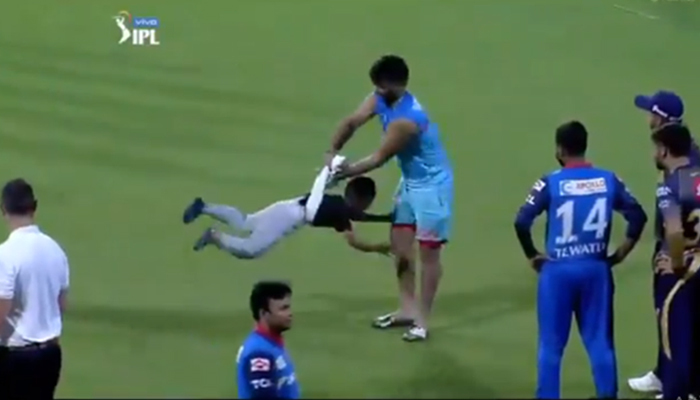 The Delhi Capitals player was seen having a gala time on the field with teammate Shikhar Dhawan’s son! The video going viral shows Pant chasing five-year-old Zoravar with a piece of cloth. The Delhi-born player, who was in an ecstatic mood after his team managed to complete the double over Kolkata Knight Riders, went on to wrap the cloth around the kid’s waist and gave him a few swings in the air. The video took Twitter back to the iconic Tim Paine episode as the comments poured in. Rishabh Pant needs to better his babysitting skills along with his batting!!! While the others came up with some ultra-hilarious comments! When Dhawan asked Pant : Zyada pareshan kare toh thoda ghuma lana..
You can love him. You can hate him. But you just cannot ignore Rishabh Pant!